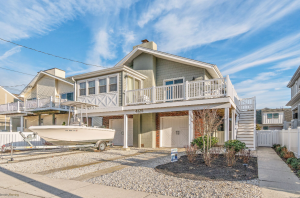 Say Hello to the Harbor Life in this Newly Renovated Avalon Home! Your perfect family retreat is waiting for you. 4125 Fourth Avenue is a 5-star vacation property with all of the amenities that your family needs to rest, play, and enjoy the beauty of picturesque Avalon, New Jersey. This quintessential beach house, built in 1978, was recently renovated to include top of the line amenities and gorgeous interior detailing. 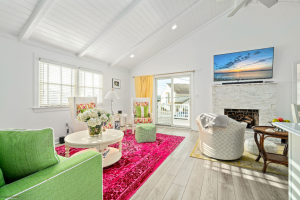 Located near the bay in Avalon’s mid-island area, the property features easy access to the best of Avalon’s shops, restaurants, night life, beach, and recreations areas, with plenty of quiet and privacy for when you want to sit back and relax. The home has 5 bedrooms and 3 full bathrooms, so there’s more than enough room for everybody to stretch out and make the most of the space. If you’re in the market for an outstanding island property, then look no further. 4125 Fourth Avenue is a fantastic choice for those who are looking for a family vacation home, as well as those interested in purchasing an investment or rental property. Read on for all of the other details you need to know about this stunning home. 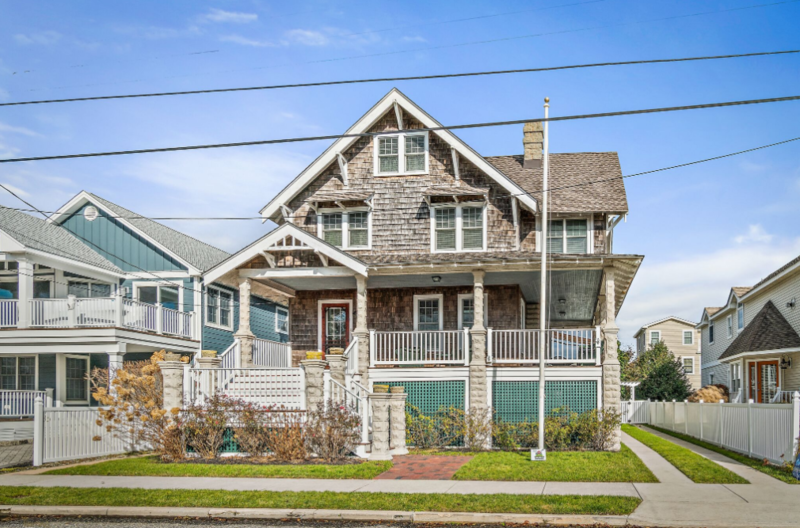 4125 Fourth Avenue provides your family with the best of both worlds: the charm and originality of late 1970’s Jersey shore architecture and a completely updated interior that’s expertly designed for modern living. The property is centrally located near Avalon’s scenic bay and is mere blocks away from the beach, making it a great choice for those who want to take in a little bit of all that Avalon has to offer. The house is ideal for families, as well couples and individuals who regularly host guests from out of town. This single-family property boasts two spacious floors of living space. A wraparound porch envelops the outside of the main living space and kitchen area, allowing a simple way to enjoy outdoor dining and relaxation. Whether you’re looking for a quiet place to unwind after a long day at the beach or a beautiful space to host family get togethers, you truly can’t go wrong with this turnkey home. The home is built “upside down,” meaning the main living space—including kitchen, family room, dining area, and sun room—are located on the second level, with bedrooms located on the first level. 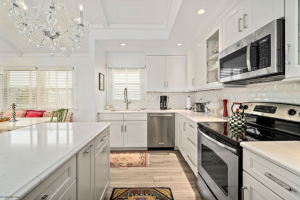 Extensive renovations took place in 2018, which added in such features as a gourmet kitchen and a marble bath off of the master bedroom. Home chefs will love the brand-new kitchen, with island counter seating for three and an open concept that flows right in to the large great room—perfect for keeping an eye on the little ones while you prep dinner. The great room itself comes with a gas fireplace encased in white brick and a 65-inch flat screen TV complete with sound system. Directly next to the kitchen and great room is a built-in dining area with seating for 10, and next to that, a quiet sunroom that offers a serene place for reading, catching up, and resting your feet. 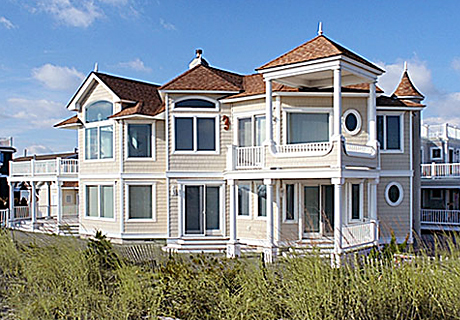 The home’s five bedrooms are roomy and bright, with new windows that let in natural light and that fresh sea air. 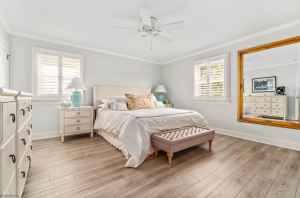 The master bedroom has been beautifully updated with new furnishings, plank flooring, and a ceiling fan for keeping cool on warm summer nights. Never miss any of Avalon’s spectacular sunsets. The large deck comes with ample furniture and easy indoor/outdoor access, making it a truly integrated part of the home. Sit outside for meals or simply watch the birds soar over the bay with a glass of wine in hand. There is also a lower patio with Adirondack chairs and a new Weber gas grill for endless family BBQs. The patio area is fenced in, making it an excellent spot for family pets to run around. In need of extra storage? The two-car garage has more than enough room for all of your kayaks, bicycles, and beach stuff, so you never have to sacrifice interior space for your outdoor gear. 4125 Fourth Avenue is a turnkey property that is sure to perfectly fit the needs of your family or your investment portfolio. This home is completely rental-friendly and offers a big opportunity to bring in extra income every year. Don’t let this amazing Seven Mile Island vacation home get away. Give us a call to schedule a showing for 4125 Fourth Avenue today and come see for yourself why this property isn’t going to last long on the market. 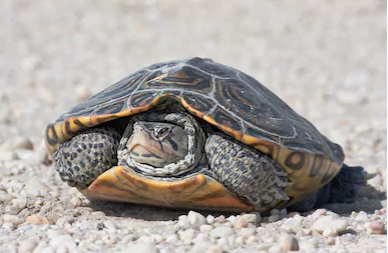 Call the RJ Soens Group in Avalon and Stone Harbor at 609.967.0466 to schedule your appointment.